Happy weekend!!!!! Just moved into my new flat a few days ago and only got everything sorted last night! I am super excited about my new kitchen. I have travelled around, living like a nomad, for a year and cooking in Airbnb’s was not easy without my favourite equipment, herbs and spices. SO, let’s make something special today. 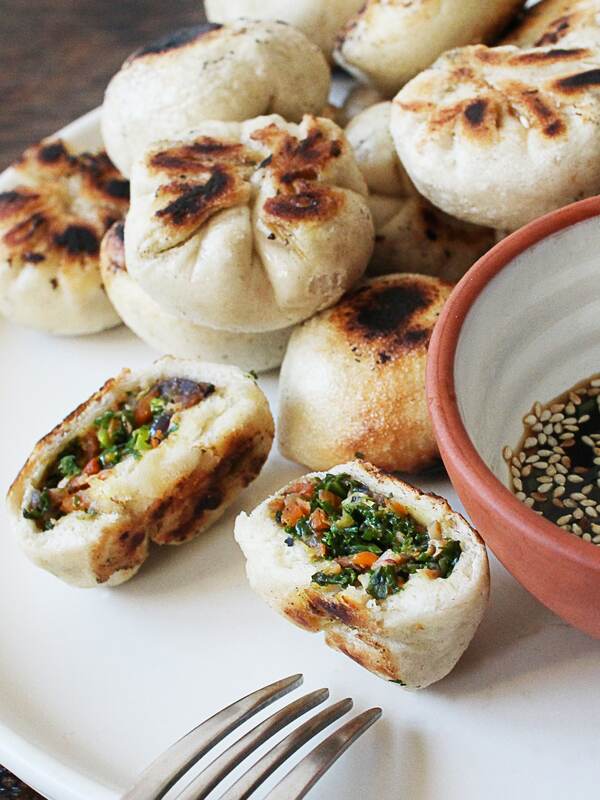 I want to show you how to make dumplings, but not just any regular Asian dumpling. As you can see from the ingredients list, I put yeast into the dough, so the texture is going to be puffy. 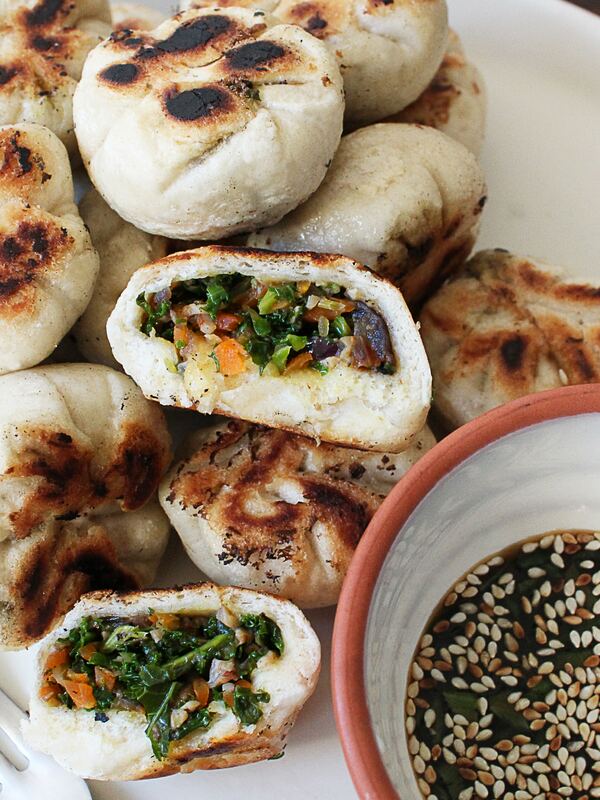 They are very much like an Eastern European dumpling but with an Asian twist or vice versa. The vegetable filling, made up of red onion, kale, mushroom and carrot, is absolutely gorgeous and light. However, you can use any vegetables you like, as long as they are not too soft and juicy. If the vegetables sweat too much; the dough is going to be soggy. Ideally you should squeeze out any excess water from the vegetables before you place them in a food processor. Roll the dough out into a flat sheet, about 2-3mm thick and cut an 8cm circle with a circle cutter. If you don’t have circle cutter you can just use the top of a glass like me. You should able to cut 15-18 circles in total from the dough. Place 2 tsp minced vegetable on to the centre of the circle. Pinch the circle closed with your fingers. It will look kind of like a parcel, a cute, little, tasty parcel. Use scissors to trim the point of extra dough off. And fold more… until you have made up all the remaining dumpling circles. Heat a frying pan over medium heat with oil and place the dumplings in with the sealed side face down. Pour about 100ml water into the pan and cover for 3-5 minutes, flip the dumplings over and fry until both sides in golden colour. Yummy dumplings are ready!! You can serve them with soy sauce with sesame, ginger with vinegar or just chilli oil… etc. 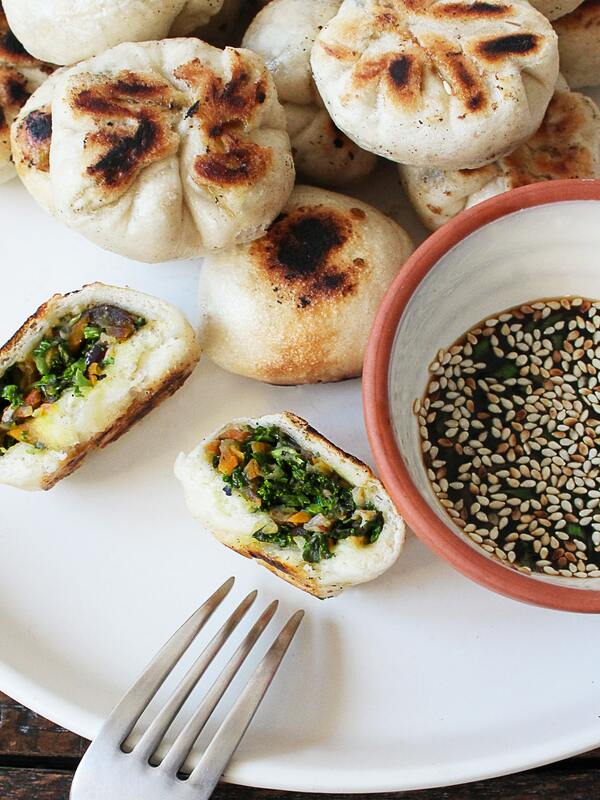 These dumplings are actually not too difficult to make. 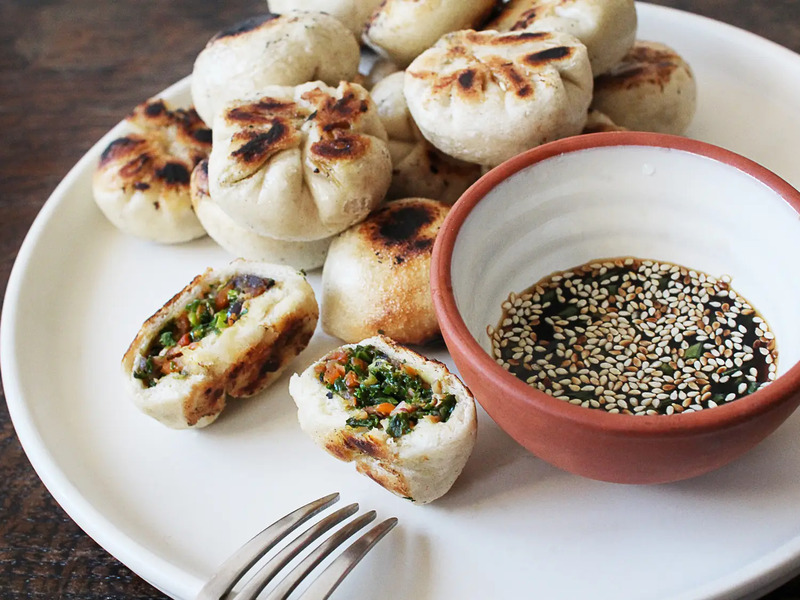 The only hassle is that you have to wait for 1-2 hours while the dough chills before you can start to wrap your little parcels, so I would recommend spending a free afternoon making over 50 dumplings and then put them into a freezer, so you can enjoy them anytime you want. P.S If you want to freeze your dumplings, warp a baking tray with cling film and place the dumplings one by one top of the tray, leave a gap between each dumpling so they don’t stick together. Allow freezing for 2-3 hours. Then transfer to a Ziploc bag and put back in the freezer for future use. Combine the lukewarm water, sugar, yeast and olive oil and let it sit for 10-15 minutes until it turns foamy. Pour in the yeast mixture and slowly mix it with the flour. Add a bit more flour if the dough feels too moist, but be careful not to make it too dry. Meanwhile eat the oil in a large, non-stick frying pan, add the minced garlic, fry for 2-3 minutes until the garlic turns slightly golden in colour. Add the vegetables and stir fry for 2-3 minutes. Add salt, light soy sauce and bouillon and stir fry for other 2-3 minutes then set aside and allow to cool for 5-10mins. Place cooled vegetables in a small food processor for 10-30 seconds until chopped finely but not a paste. (Don’t blend it too long as you still want there to be small pieces of vegetable) Place in a medium-sized bowl set aside. Sprinkle some flour onto a flat work surface, take the dough and knead it for about 1-2 minutes, then roll it out to 2-3mm thickness. Cut a circle from the dough with an 8cm circle cutter (if you don’t have circle cutter you can use to top of a glass). You should able to cut 14-15 circles from the dough, then squash together the off-cuts and re-roll to make 3-5 more circles. Place cooled vegetables in a small food processor for 10-30 seconds until chopped finely but not a paste. (Don’t blend it too long as you still want there to be small pieces of vegetable). Spoon 2 teaspoon on to the centre of each dough circle and close the dumpling by bringing the edges to meet in the middle and pinching to seal. Use scissors to trim the point of extra dough off. Repeat this process for the remaining dumplings. Heat the oil in a large, non-stick frying pan and place the dumplings into the pan, the sealed side face down, leaving a gap between each dumpling so they don’t stick together. Pour about 100ml water into the pan. Cover and turn the heat to medium then leave to simmer until there is no water left in the pan. Flip the dumplings over and you should a nice brown colour developing. Fry on the other side other 3-5 minutes, until both sides are in lovely brown colour. Serve with your choice of sauce (soy sauce with sesame, ginger with vinegar or just chilli oil... etc. ).